Encircle the Turtle is currently being featured as Game of the Week on AppEpic.com! Check that out here. 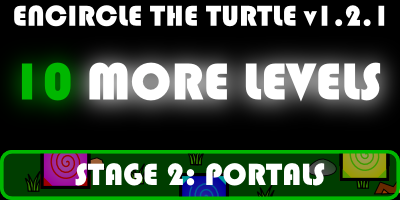 -TEN more campaign levels with the release of Stage 2: Portals! -An In App Purchases option to permanently remove (those annoying) ads from the game! Be on the lookout for the update! Many people reported to me over the past couple days about a bug that sometimes happens when the player tries to scroll while the turtle is moving. Update 1.1.1 fixing that bug just hit the App Store, so be sure to download that ASAP! The guys at iGeeksBlog have put up a review for Encircle the Turtle!